What will it take for white Americans to distrust the police? If a political movement's goal is to stay at the top of the headlines, one big shocker won't do the trick. A single story can't maintain traction for long, so the wiser strategy is to parcel out information so each new revelation reopens the wounds of the last, gradually building evidence and converting the skeptical until your opponents are on the defensive and your goals are impossible to ignore. Any observer of politics has seen this tactic in action. It's why those Planned Parenthood videos were released in stages. It's why Edward Snowden spent a year releasing what he knew about NSA spying. It's at least partly why Hillary Clinton is endlessly dogged by revelations about her private email use during her State Department tenure. The value of a steady stream of updates to the same story can be seen in the cause of criminal justice reform, too. Yet here the tactic is employed unwillingly, for it is vivid stories of police brutality which capture the public eye. "If it bleeds, it leads" — but the whole point of reform is to stanch the bleeding. The effects of this awful paradox have been evident in the last year and a half, as a cavalcade of high-profile police killings led to shifts in public opinion on police violence, law enforcement accountability, and institutionalized racism. Polls saw trust in police hitting a record low, while support for transparency measures rose across the political spectrum. Following Eric Garner's chokehold death, a clear majority of Americans opposed the grand jury's decision not to indict the officers involved. When Walter Scott was fatally shot five times in the back by a cop, support for charges against the officer was nearly equal among blacks and whites. At the start of 2016, some of that indignation and enthusiasm for reform is fading — among white people, that is. Brutality cases like the death of black teenager Laquan McDonald at the hands of Chicago police, which once would (and should) have provoked national controversy, now seem to be met with desensitization and indifference outside of local protests. This change isn't only anecdotal: A Gallup poll released in late December found that Americans' faith in police honesty and ethics was on the rebound. 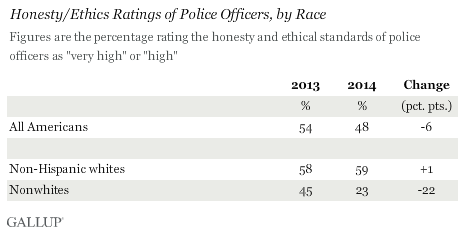 More tellingly, white Americans don't seem to have registered much distrust in police at all. While non-whites' rating of police declined by a precipitous 22 percent from 2013 to 2014 — producing that record low — white people's faith in police increased year over year from 2013 to 2015. Despite isolated bursts of anger about specific cases (like Garner and Scott), white people have found police more trustworthy after the past 18 months of notorious police custody deaths and resultant protests than before. "The system always desires to return to a state of the status quo," says Austin Channing Brown, who serves as the multicultural liaison at Calvin College and is engaged in the Black Lives Matter movement. That's why Brown believes it's not surprising that white Americans struggle to maintain urgency in regards to police brutality, but she also attributes this disinterest to the comparative lack of risk of official violence in white lives. "If we have learned anything over the last couple years, I hope it is that police actions vary quite drastically between communities," Brown says. "What white communities are experiencing maybe trustworthy and honest behavior, but that doesn't mean it's what all communities are experiencing." For many white Americans, police misconduct is out of sight and therefore usually out of mind. Though occasionally a story like Garner's may spark scandal, by and large criminal justice reform is someone else's problem. In the face of this pull toward apathy, I can't help but wonder: What would it take to make white Americans consistently care about police brutality? What would it take to make it our problem, too? But first, a related question: Does white involvement matter? Is the sympathy of the white majority necessary to produce meaningful change in police use of force policies and the justice system more generally? Brown argues that Black Lives Matter and other criminal justice reform efforts will prove to be an important movement for black liberation regardless of whether white Americans get on board, and Brittany Packnett, a Ferguson activist who serves on the White House Task Force on 21st Century Policing and the planning team of Campaign Zero, agrees. "I would actually take it one step farther and say that this will continue to be an important movement for black liberation and systemic equity regardless of who gets on board of any race," Packnett remarks, noting that the civil rights movement of the 1960s accomplished a great deal without universal support. "Rev. Jeremiah Wright recently asserted that only 13 percent of churches were on board with the civil rights movement during the days of [Martin Luther] King," she says, referencing remarks made by the controversial former pastor of President Obama. "There were plenty of people — including the white moderate preachers to whom he wrote his 'Letter from a Birmingham Jail' — that were not on board, though King has been sanitized and canonized in such a way that everyone upholds." Today too, the protest wing of the criminal justice reform movement may join King's lament at the disinterest of the white moderate, but will not wait for its reversal. As Packnett concludes, "Not everyone is down with this movement — white or black. That doesn't mean the work doesn't continue. If we waited to do what was right until it was popular, we would never get anything done at all." The prospect of getting things done about police brutality with or without majority support is daunting if we only imagine sweeping national reforms fueled by a universal demand for change. But that alluring focus can actually become a distraction, says Jonathan Blanks, a research associate at the Cato Institute's Project on Criminal Justice who manages PoliceMisconduct.net. "I think it depends on what you're trying to do. Police misconduct is inherently a local problem," Blanks said in response to a question about the usefulness of the white majority in pursuit of criminal justice reform. "We have 18,000 police departments in the United States, and they're all going to have some sort of local control, and they're going to be guided by local ordinances or state laws." Large-scale momentum helps, but the national attention span is brief and quickly jaded — especially among white people who may never be personally affected by police misconduct and other justice system abuses. Blanks argues that concrete policy and procedure changes at the city and state levels will save more lives than another headline. Though decidedly unglamorous, persuading local police departments that reform is in their best interest can be accomplished by relatively few people. Particularly in larger cities, Blanks says, many police departments operate with a "business model mentality," looking for ways to increase efficiency and effectiveness. For justice reform advocates of any stripe, painting transparency and accountability measures as just such an improvement can be a realistic, if bureaucratic, path to progress. What those changes look like will vary widely by locale. "Every community is going to have to come up with, 'What do we need the most? What's wrong with our police department?'" Blanks notes. "Sometimes adding body cameras will do it. Sometimes a switch at the chief level, at the administrative level, will bring wanted change. Other times it's deep-down, systemic problems — blue wall of silence, the whole mess — like you see in Chicago." And the good news is that these local measures are themselves an easier sell than a sweeping national reform. Using body cameras, for instance, is something typically decided at the city level — and it also has the support of an impressive 92 percent of Americans, per a Cato/YouGov poll released in January. Many white Americans may not agree that the justice system is systemically broken, but they are still persuaded that this transparency measure is a good move. To be sure, there are federal fixes, too. For example, the much-publicized White House ban on the distribution of certain types of military equipment from the Pentagon to police accomplished quite little, primarily prohibiting weapons that weren't distributed to begin with. A more effectual ban can and should be implemented. Similarly, the federal government can address lengthy mandatory minimum sentences, another cause which draws majority national support, as well as over-criminalization. This includes but is not limited to the failed war on drugs, which disproportionately affects black Americans. Repealing a multitude of the 3,000 crimes in the federal criminal code (not to mention the 300,000 additional federal regulations that can be enforced in criminal court) would reduce opportunity for official misconduct. But still, Blanks contends, many of the dysfunctions at a given police department are local in origin and therefore local in solution. Though some departments may be more intransigent than others, making federal intervention (like the Department of Justice investigation of the Ferguson PD) attractive, in most cases a persistent group of local activists and academics can push through consequential administrative reforms. The potential for meaningful progress without much white participation by no means absolves white disinterest in police brutality. Black Lives Matter and the cause of criminal justice reform more broadly can continue regardless of white Americans' views — in Brown's words, "the more the merrier, but not everyone is necessary to create change." Yet, as Brown adds, evidence of white apathy should leave us "concerned about what it means for [our] own humanity." And since it is our humanity at stake, it is also our responsibility to make police misconduct our problem, too. What it would take to make white Americans consistently care about police brutality is the ongoing persuasion and enthusiasm of white Americans who already care. We can — and must — persuade ourselves. Reform is not important because there's a bogey man with a badge lurking around every corner. It is important because police misconduct is a systemic problem and the inequitable and byzantine features of our justice system demand attention irrespective of personal experience. "And that's why you should care," Packnett argues — not because of the shock of the latest police killing, but because that killing is just one boom in a problem that normally hums along at a dull roar.